Dynamic sediments and sediments with active biogeochemistry often generate a variety of chemical compounds, some of which will be gaseous. This inverted echo-sounder image from October 30, 2011 at the Delta Dynamics Laboratory in the Strait of Georgia at 108m water depth near the mouth of the Fraser River has captured numerous clouds of rising bubbles. The Parascientific Pressure sensor located at our Fraser Delta site caught the oceanic signal of the local 6.3 earthquake of September 9, 2011 (12:41 PDT). The pressure sensor is located on a bottom mounted platform and samples at a rate of ~700 ms.
During rising and high tide, the sea pushes back against the Fraser River, reducing its flow at the mouth. As the tide falls, approaching low tide, the flow at the river mouth increases, and the sediment laden river water is “released/floods” into the Strait of Georgia. 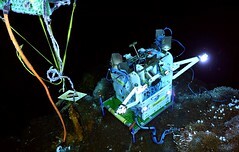 This image was captured from the Strait of Georgia Webcam video feed at 300 m depth. The spotted ratfish,&nbsp;Hydrolagus colliei, is a cartilaginous fish related to sharks and rays, and is the only species in its subclass found off British Columbia. This high resolution, nearly-continuous dataset detects seasonal variations and climatic shifts in the coastal Pacific Ocean. A juvenile giant Pacific octopus, Enteroctopus dofleini, pounces on a passing tanner crab, Chionoecetes bairdi. Once the crab is secured the octopus retreats and will consume its meal in the safety of its den. E. dofleini is a stealth predator that primarily eats crustaceans, other mollusks and fish. This video was captured on the Strait of Georgia webcam at 300m depth. During the late summer and early fall, high saline water upwelled along the west coast of Vancouver Island makes its way into the inland basins, including Saanich Inlet and the Strait of Georgia.